From left-front: Mark Risser, family matriarch Barbara Risser with the hand of family patriarch Ben on her shoulder, Lauren Yutzy, Lena Risser, Maria Yoder, Benjamin Riser. Behind: Dave Yutzy, Kathy Risser, Jewel Yutzy, Joy Yoder, Nate Yoder, Dan Risser. On April 29, Mark Risser graduated from Eastern Mennonite University. His cousin, Elisabeth Barthlow, 22, of Cleveland, Tenn., officially received her diploma in December, but walked across the stage with him this spring. The cousins are just two of nearly two dozen family members to attend EMU over the last half-century. For three generations, 21 members of the Mennonite Risser clan have flocked to the Friendly City to attend the university. Of those, most were involved in music in one way or another. For example, last semester, five cousins were in the same choir. On the first day of the semester, their director, Kenneth J. Nafziger, joked that the Risser “Mafia” was taking over the class. 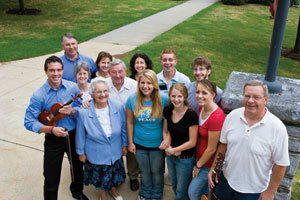 The family tradition started in 1949, when the cousins’ grandmother, Barbara Risser, attended Eastern Mennonite College (now university) as a freshman. About a year later, young Barbara returned to her Pennsylvania home and married her childhood friend, Ben Risser. Meanwhile, the couple had five children â€” Benjamin, Dave, Phil, Joy and Jewel â€” who all took voice lessons and sang in various church and school choirs. In the summertime, the family’s love for music was loud enough for the whole neighborhood to hear, the couple said. The family grew and matured. By the 1970s, it was time for the oldest son, Benjamin, to choose a college. His decision, his mother says, was obvious. “We just talked so much about EMC there wasn’t much debate,” she said. One by one, all five children eventually attended EMU, each meeting and marrying their spouses at the school. So many members of their family moved to Harrisonburg, Barbara and Ben Risser followed. “We jokingly call ourselves the tribe of Benjamin,” Barbara Risser said, referring to one of the 12 ancient tribes of Israel. And then came the third round of Rissers. As Barbara and Ben’s children had their own kids, the tradition continued. Of their 16 grandchildren, 10 have attended EMU and two more are making plans to do the same. For now, Barbara and Ben Risser say they keep themselves busy visiting their children and grandchildren at the university. Gone for a while, anyway. That is, until round four. By Heather Bowser of the Harrisonburg Daily News-Record, reprinted with permission.